We are happy to report the opening of our new Sea Turtle Recovery Room. [The space that housed the Sea Turtle Recovery Room is now The Trust Family Foundation Shark and Ray Touch Tank. Rescued sea turtles are now cared for at the new, much larger Animal Care Clinic in Quincy.] The recovery room features a 25-foot-long pool and a 15-foot-long pool. We have recently moved three of our rehabilitating turtles to the new tanks (Bruce the loggerhead, and Bubba and Casper the Kemp's ridleys). The recovery room is on display in the West Wing of the Aquarium, so stop by to visit our turtles! This is an update on our Kemp's ridley turtle named Route. You may recall (from this post) that Route came to us in October after being found on a Cape Cod beach. Route had severe wounds, a broken left humerus, and had lost a lot of blood. I am happy to report that Route is doing quite well. In this photo, you can see Route's injured left flipper (the end is missing). He is swimming well, eating well, and trying to bite us! These are all good signs. Route is no longer anemic, as his body has regenerated the blood cells that were lost during his original injury. 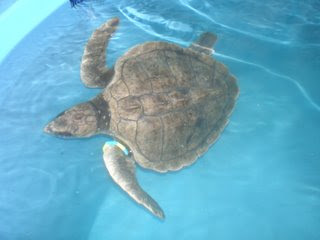 We recently removed the metal bars that were used to stabilize his broken flipper. The bone did not heal perfectly and it has not yet completed healing, but it is healing in a functional position. His other wounds are all healing very well. We are hopeful that Route will be released in summer 2009. In addition to our sea turtle work, we also work with a number of conservation programs for native freshwater turtles. This is "Skip," a Blanding's turtle. Blanding's turtles are found in marshy wetlands in the northern United States. Here in New England, Blanding's turtles are very rare. In Massachusetts, they are found at only a few locations, with relatively few turtles at each location. In most areas, Blanding's turtle populations are declining due to habitat destruction, road mortality (females are often hit by cars when looking for nest sites in spring), and illegal collection as pets. Because of this, Blanding's turtles are protected under Massachusetts law as a threatened species. In 2007, Joe Masi, one of the aquarists here at the Aquarium, found a Blanding's turtle during a field survey of a swamp in southeastern Massachusetts. This location was not previously known to have a population of Blanding's turtles and this initial discovery has led to more intensive surveys of the site. So far no additional specimens have been found. Skip came to the New England Aquarium recently after he was confiscated by state officials. He was being illegally kept as a pet. Unfortunately, he cannot be released back to the wild because we don't know exactly where he came from and he was exposed to a non-native turtle in captivity. Turtles have genetic adaptations to certain geographic areas, and they have a well developed home range. Thus, releasing a turtle of unknown geographic origin carries the risk of introducing genes that are not adapted to that location. Often turtles that are released outside of their home range keep wandering indefinitely, and never join a population. 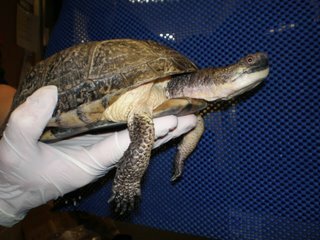 Also, exposure of native turtles to non-native turtles carries the risk of introducing disease into the native population. All of these factors could be devastating for local species. So ... Skip will live with us at the Aquarium and serve as an ambassador to educate the public about turtle conservation. Please remember that many of our native turtles are threatened or endangered, and be sure not to take such animals out of the wild. 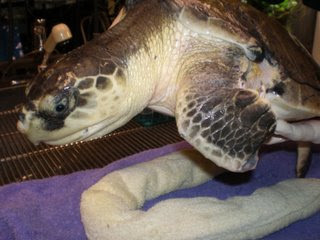 We are very worried about one of our Kemp's ridley turtles, Orion. 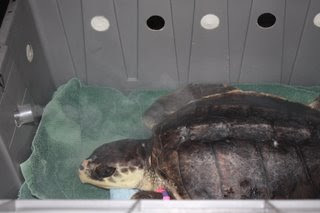 Orion was admitted to the hospital on December 5 after being found stranded on a Cape Cod beach. He was affected by hypothermia, or cold-stunning. His condition improved over the first few weeks at the New England Aquarium, but we have recently found that he has pneumonia. Pneumonia, or infection of the lungs, is common in stranded sea turtles because they have a weakened immune system, and they sometimes inhale sea water as they are washed up on the beach. We are treating Orion aggressively with intravenous and intramuscular antibiotics, oral antifungal medication, and with nebulized antibiotics and antifungal medication. This photo (courtesy of Rehab team member Adam Kennedy) shows the nebulizer treatment. The box is covered when the treatment is performed to keep the medicated mist within the box. The medicated mist will hopefully get into Orion's lungs when he breathes. This photo photo shows a microscopic image of fluid we recently collected from his lungs. The large purple cells on the right side of the picture are epithelial cells from the lung. The small purplish dots all over the picture are bacteria. The bluish, segmented, straight structures in the middle of the image are called fungal hyphae, which are fungus cells. Such pneumonia cases can be fatal for sea turtles. We had one piece of good news yesterday when Orion ate a crab! I will keep you informed of his condition. We are awaiting some lab tests to identify the types of bacteria and fungus that are present, and to determine which drugs will best kill the bacteria and fungus. This is an update on the Kemp's ridley turtle named Casper. The last post about Casper, on December 16, reported that he had begun a GI contrast study because his digestive system was not working well. Eventually, all of the contrast material passed through his digestive system. It took nine days, but it all made it through! Casper has been eating very well lately, and we have started to wean him off some of the drugs that helped his digestion. We are hoping that his system continues to function normally after the drugs have been stopped.